Audio Cubes: Tangible Interface for Audiovisual Creation workshop with AudioCubes designer Bert Schiettecatte :: November 10 and 19, 2009; 9:30 am – 5:15 pm :: Brussels, Belgium. The Audio Cubes: Tangible Interface for Audiovisual Creation workshops are about exploring the possibilities of tangible interfaces for audiovisual artwork, in particular in sound design, music composition and live performance. 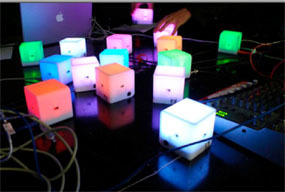 The participants will be introduced to the AudioCubes musical interface and its applications. AudioCubes are a new way to create audiovisual work through gestures and phsyical interaction with a network of intelligent wireless objects. In the practical afternoon session of the workshop, participants will work on their personal projects using AudioCubes with the assistance of the designer. Who: Professional artists with experience in music composition, sound design or live performance and an interest in technology, computers, human interfaces and software.